The Belyando-Suttor catchments are bounded to the west by the Great Dividing Range, to the south-east by the Fitzroy River Basin, to the north-east by the Leichhardt Ranges and to the north by connection to the Cape and Burdekin rivers. 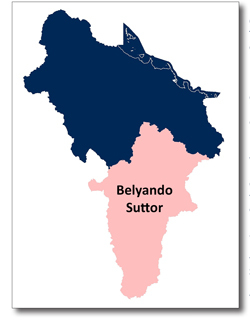 The Belyando Catchment extends from about 50km south of Alpha, with the Belyando River flowing about 200km to the north before joining the westward-flowing Suttor River. The Suttor River flows north from the junction to the upper reaches of the Burdekin Falls Dam. Most of the country is undulating old sedimentary basins or alluvial plains. The vegetation is open acacia and eucalypt woodlands within the Northern Brigalow bioregion, as shown on Figure 15. This is interspersed with areas that have been cleared for improved pastures and dryland cropping. The area that includes part of the Desert Uplands bioregion has a drier climate along the sandstone hills of the Dividing Range, with thickly-vegetated acacia woodlands or eucalypt woodlands with a spinifex understory. The Desert Uplands bioregion is particularly diverse ecologically, and intact areas contain near-threatened and endangered species. It features ten national parks, state forests and private conservation lands, but most are small and isolated, and while important for conservation, they are mostly difficult to access and are not tourism destinations. Alpha in the south is the main population centre with around 400 residents. The sub-region contains the majority of the 247,000km² Galilee thermal coal basin, which is one of the largest untapped coal reserves in the world. It also contains a section of the Bowen Basin, which extends into the Suttor River Catchment. These operations are serviced from Moranbah, which lies just outside the Burdekin Dry Tropics region to the east. The rest of the population is spread sparsely on large grazing and cropping properties. The sub-region is characterised by long-distance road and rail freight networks. Over 90 per cent of land is under beef production, but between Alpha and Kilcummin there are areas of sorghum cropping, for export by rail and ship to markets such as Asia for alcohol production. In the past, the area featured intensive irrigated cropping, such as cotton. Some properties still maintain the necessary support infrastructure and could potentially resume these practices should market conditions improve. Coal mining or mining exploration and development is a significant economic enterprise in the area. Currently, nine coal mega-mines are proposed for the Galilee Basin, which at full production would double Australia’s coal exports to over 600 million tonnes a year (Sunrise Project, 2015).